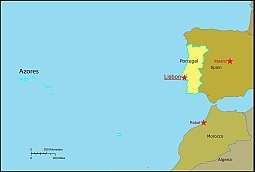 Editable royalty-free map of Portugal in vector-graphic online store. A NATION OF GREAT SEAFARERS, Portuguese explorers sailed the world in the 15th and 16th centuries. They claimed territories as far apart as Africa and Asia, and they also colonized Brazil.From 1932–1968 Portugal was ruled by the dictator António Salazar, but after a military coup in 1974, the armed forces finally withdrew from politics. In 1986 Portugal joined the European Community, but it remains one of the poorest countries in western Europe. Tourism, particularly in the Algarve, is important to the economy.